Another year has come and gone, and with 2015 now firmly in the rearview, it’s time to look forward to the biggest Xbox One game releases of 2016. Well, the biggest games that XBLA Fans will be bringing you coverage of, at least. That means no retail titles but plenty of promising ID@Xbox games, free-to-play releases and other digital Xbox One releases. Regular readers will recognize some of these games from last year’s list. Well, delays happen, but they haven’t done anything to blunt our interest in the returning 2015 titles joining all the new ones on this year’s list. If anything, we’re anticipating them now more than ever. Nathan Bowring, Senior Writer: Indie darling Gone Home is finally coming to Xbox One in early 2016. You play as Kaitlin, who’s returning home to visit her parents and sister only to discover they’re not home. Alone in their large mansion in the middle of the night, she explores the house to discover what her family’s been up to while she was away. While the naysayers may unfairly write this game off as a “walking simulator,” in actuality it’s one of the most cleverly crafted narratives you’ll ever find in a game. Christine Mitchell, Senior Contributor: The Banner Saga has been on our watch list for a while now, but the viking-themed, turn-based RPG is now finally set to arrive on Xbox One early in the New Year. With combat similar to Final Fantasy Tactics and lush hand-drawn animations comparable with early Disney movies, Banner Saga‘s hype train is now more than ready to leave the station. To top it off, the game was created by Stoic, a trio of indie game developers formerly of BioWare fame, and it’s already out on PC with rave reviews. Michael Cheng, Staff Writer: Capcom released a remaster of Resident Evil for Xbox One and Xbox 360 on January 20, 2015. Having reviewed the title here, I can tell you it was a pleasure to play through and was one of my most enjoyed releases of 2015. One day shy of a full year later, Resident Evil 0 will be arriving to create a creepy atmosphere for players. Playing through will be a treat, and the new Wesker mode should be an interesting spin, even for those familiar with the game from an older generation system. I’m not a fan of remakes, but this one will (hopefully) be good. Scott Baker, Contributor: When you think of a war video game, you probably see a dude with a gun. He might be walking away from explosions. He probably made those explosions. But he probably isn’t a starved civilian in black wreckage scrounging for food, shelter…and kindness. This War of Mine is about what happens after the call of duty fades. Who do you trust? How do you survive? How do you live? Don’t expect Deep Silver to pull any punches on how rough it can get. David Rosen, Staff Writer: Unravel was my favorite game of E3 2015, hands down. This adorable puzzle-platformer has an excellent design hook, which, unlike some games, adds directly to the gameplay. You are a lovable little yarn doll named Yarny who gets lost and must go on an adventure in the real world. Puzzles are solved by unravelling some of your yarn to create bridges, swing from trees and get around other obstacles. But you can’t unravel too much or you’ll run out of yarn. It’s a unique take on the 2D puzzle-platformer, and I can’t wait to get my hands on it again. David Rosen, Staff Writer: By now most of you know about Mighty No. 9. This spiritual successor to the all-time classic Mega Man series looks like it will retain everything that made those games so popular, including non-stop action and gaining the bosses’ abilities — all while bringing it all into the 21st century. And yes, that includes the insane difficulty. Why would anyone put themselves through the level of difficulty that this game will surely have? Because it’s going to be a blast to play. 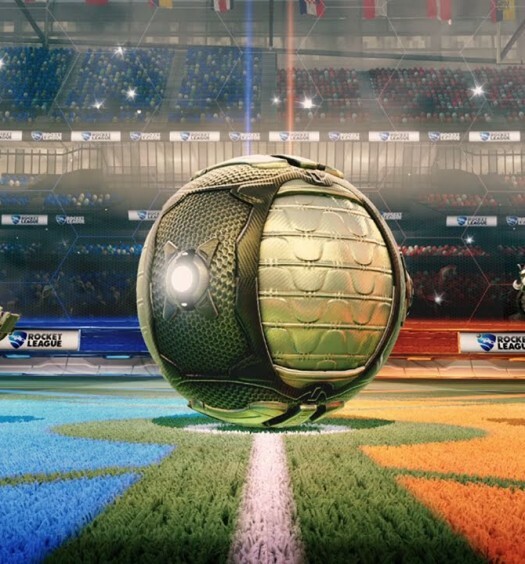 Scott Baker, Contributor: As someone who has been enjoying Rocket League on other platforms for a while, I can tell you upfront: you should be excited. This supercar/sports remix took off on PlayStation for good reason. It’s basically soccer, except you’re a zipping, flying missile with wheels. There is nothing better than thrusting your boosters and blasting the ball for a perfect goal. And, the Xbox One version comes with a lot of bonus maps, modes and cosmetics that weren’t there at launch. Grab some friends and book the night, whether they’re across the country online or at home in splitscreen. Jill Randolph, Contributor: When we reported, live from E3, that Telltale had announced The Walking Dead: Michonne, we had an insane amount of reads, tweets and retweets, which says that our readers are just as excited for this game as we are. The recent announcement that Orange is the New Black’s Samira Wiley would be voicing Michonne only added to the excitement that was already brewing for this Telltale spinoff of the series that put it on the map. Michael Cheng, Staff Writer: Oxeye Game Studio will be under tremendous pressure to perform well with Cobalt because publisher Mojang is responsible for Minecraft, one of the most popular games in a long time. After watching the trailer, I have mixed feelings on the game. Cobalt raises red flags that I don’t like to see, including having its release date pushed back and silly game mechanics like slow-mo. However, if Oxeye is able to nail the game mechanics, this could be a game that lives up to its promise. Nick DePetris, Contributing Editor: DayZ has already been in Early Access on Steam for two years, but 2016 will see the game make its way over to Xbox One’s Game Preview program. The open-world zombie survival game has been a fan favorite since its mod days and has a lot of features still in the works: vehicles, animal life and additional crafting tools. While more recent games such as Ark: Survival Evolved offer their own interesting take on the genre, Xbox One owners are still aching to get their hands on the standalone version of the survival mod that took the world by storm. John Carson, Contributor: Like fine wine and cheese, Gothic art and heavy metal were made for one another. Slain! looks to use them both to great effect to complement the unforgiving fight of protagonist Bathoryn against seven deadly tower overlords. The detailed, atmospheric and often gruesome pixel art is akin to an advanced Altered Beast or Chakan: The Forever Man. Bathoryn uses cool swords and sorcery to dispatch of his hellish enemies, but that may not keep him alive for long. Like Altered Beast, Slain! promises to not be a walk in the park. Even though I know I’ll end up cursing like a sailor at it, a throwback the likes of Slain! is always welcome. Nick Santangelo, Managing Editor: One of several titles making a repeat appearance on this list from last year, Hyper Light Drifter will (hopefully) finally release within the next five months. That may not sound all that close, but when you consider that this is a game that was first announced as a 2014 release before being delayed again and again and again, this spring doesn’t sound so bad. Heart Machine’s A Link to the Past/Diablo pastiche has been really fun to play in demos — it’s also been really hard. Really, really hard, actually. I died more times than I can count back at PAX Prime trying to beat a giant frog boss, but I’m still counting down the days until release. Christine Mitchell, Senior Contributor: Most Xbox gamers should be familiar with the Fable series — staple action-RPGs for Microsoft since the original Xbox console. Fable Legends, however, puts a new spin on your adventures in Albion with a focus on 4 vs. 1 asymmetrical multiplayer. Choosing to play as a hero will feel similar to other Fable games as you team up in third-person action RPG combat; however, those who wish to embrace their evil side will enjoy a more tactical affair of setting up traps and ordering attack units. Fable Legends will be free-to-play and will also feature cross-play with Windows 10 PCs. Scott Baker, Contributor: I should start by disclosing that I am a backer of Yooka-Laylee, but that’s only because this is hands-down my most anticipated game of 2016, maybe even of this decade. Nintendo defined 3D platformers with Super Mario 64 in 1996, and Rare iterated on it with Banjo-Kazooie in 1998 with their own style of humor, exploration and fluid movement. Over 15 years later, the Rare alumni at Playtonic Games are bringing the genre back with a spiritual successor that hits all the right notes. I can’t wait to see how they will revisit the genre in HD after working on wildly different projects for years. David Rosen, Staff Writer: Have you played Limbo? If not, stop everything you’re doing and go play it. It’s not hard to argue that it’s one of the best games of the last generation, so we’re all excited to see what Playdead comes up with next. From the look of the trailer, it’s another atmospheric, unique, beautiful, weird and slightly creepy puzzle-platformer. This time around it looks like there is even more danger looming around every corner. The big question is how many times we’ll replay this one. Nick Santangelo, Managing Editor: Regular readers will recall that Capybara’s subterranean roguelike made an appearance on last year’s biggest games list, but Capy officially pushed Below back to 2016 earlier this month. Of course, that doesn’t mean we’re anticipating it any less now. If anything we’ve only grown more impatient to wander lonesomely back into its great depths and uncover the horrors and wonders hiding in its darkness. Vestiges of ancient civilizations? Ghoulish humanoid creatures? Mysterious shipwrecks? You’ve got our attention, Capy. Christine Mitchell, Senior Contributor: Ashen is an action rpg from developer Aurora44. Set in a world without sun, where natural light comes from eruptions that cover the land in ash, Ashen is about forging relationships with other characters in its harsh open world. The game is set to feature passive multiplayer in which players can drop in and out of each others’ worlds as they explore the wilderness. If you both stay alive and in close enough proximity you will stay connected, but these connections will be fleeting, so finding another person out there will be a special thing. Nathan Bowring, Senior Writer: Pit People is The Behemoth’s fourth game, continuing the developer’s mission to never tackle the same genre twice. Time and space are fractured after a giant space-bear crashes into the Earth, creating a chaotic new world filled with anachronisms and humanoid cupcakes. 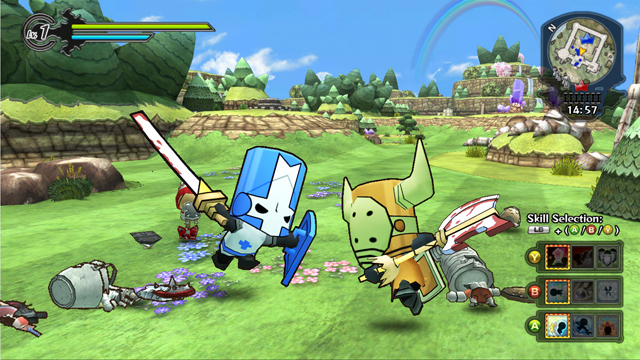 The game was designed to be a more streamlined take on turn-based strategy games, where enemy encounters are both faster and easier to understand. As always this game will feature glorious 2D animation by Lead Artist Dan Paladin, as well as voice work by BattleBlock Theater narrator Will Stamper. John Carson, Contributor: After making a short debut at E3 2014 and having a larger presence at E3 2015, Cuphead has continued to impress us with its 1930s cartoon aesthetics. Studio MDHR has made the effort to replicate the look of cel-animated features by inking and painting all of the art by hand, and it is nothing short of stunning. This doesn’t make our list on looks alone, though. Partnered with the retro look is a co-op 2D shooter revolving around a series of tough-as-nails boss encounters with devilish mermaids, giant birds and surly boxing frogs. It looks beautiful and difficult, which makes Cuphead a must try when it releases sometime this year. Jill Randolph, Contributor: The “Rage” is in quotes here because due to a recent trademark issue, Fenix Rage (as it is currently known on Steam) will not be able to go by this title at the time of release on Xbox One. The Xbox port of this Super Meat Boy-esque platformer from Green Lava Studios has been a long time in the making, with the Xbox One version originally forecasted for 2015, but now being slated for sometime in 2016. It seems the road for Fenix has not been easy, and the game promises the same for its players. In other words, expect to die. A lot. Nathan Bowring, Senior Writer: SUPERHOT is a first-person shooter operating on a simple yet unique premise: time only moves at full speed when you move. Run around and the game appears to play like any other FPS, but if you stand still the scene slows down to a crawl. Everyone stops dead in their tracks and bullets hang in the air, giving you the perfect moment to plan out the next part of your perfect action hero shootout. Fight against an onslaught of crystalline enemies as you elegantly dodge their fire, systematically take them out and fulfill all your Matrix-themed fantasies. Nick Santangelo, Managing Editor: Originally slated for a September 2015 release date, Three One Zero’s astronaut exploration game Adr1ft was pushed back to coincide with the Oculus Rift’s launch. Though the Rift still doesn’t have a release date, it was just revealed that pre-orders will be opening in just a couple days, and Three One Zero stated in October that Adr1ft would be out in “early 2016,” but whether or not applies to the console versions remains a bit murky at this point. XBLA Fans went hands-on with the VR version of Adr1ft at PAX East 2015, and I came away extremely impressed with its sights and sounds. Soon we’ll find out if the game can be as immersive without a virtual reality headset and if the gameplay lives up to the game’s spectacular audio/visual quality. John Carson, Contributor: ION is a game as mysterious as the vacuum-sealed clone in the teaser trailer. DayZ creator Dean Hall has set out to make an ambitious sci-fi MMO on a galactic scale — one with a persistent galaxy filled with simulated environments and even simulated people with simulated organs and built on technology created by Improbable. The tech looks cool; however, there are a lot of potential moving parts. There’s still a lot of questions surrounding what ION actually is since we haven’t heard anything about it since E3. Here’s hoping we get to experience it in the next 12 months. Jill Randolph, Contributor: I am not a huge MOBA player. It isn’t that I don’t like them; it’s just that most matches take too long for my busy schedule. That being said, I’ve played Motiga’s Gigantic multiple times, and this is a MOBA I could see myself playing. The matches are fairly short, which I appreciate, but Gigantic’s new approach to the genre is what makes it unique. Each team has a guardian, a mythical monster that gains points with every kill, eventually filling a meter that releases them to fight alongside you. To win, you must defeat the other team’s guardian in the climatic “Clash” battle. Nick DePetris, Contributing Editor: Telltale Games has produced some incredibly powerful episodic stories over the past few years, from The Walking Dead to Tales from the Borderlands. At the Game Awards in December, Telltale announced they would be tackling another prime franchise, Batman. Little information has been released apart from the teaser, but even with so many interesting takes on the Batman story in recent years, Telltale’s version is still one worth looking forward to.